A small bedroom comes with a lot of responsibility! We have to be careful while selecting the furniture for it. Everything has to be of appropriate size and provide maximum utility. And, one among the list of furniture to be added is the ‘Single bed’. We can accomplish the task of making the bedroom peaceful, comforting and relaxing, simply by incorporating a single bed! Being of a compact size and the amazing feature of matching entirely with the lesser space, makes single beds the best for the small apartments, guest rooms or bachelor pads. The compact size doesn’t make the single beds lag behind in the race of style! There is an ocean of options that would lure you in. From upholstered to trundle, the single beds are available online in a wide variety. Are you super-impressed with this amazing unit? Well, that's not enough, you haven't even read the perks that it offers. Look at the 6 perks of the wooden single beds that make the most of the bedroom! With the single beds, you don't have to decide where to place it in the room. Point one of the dull corners in the small room and assemble the single bed there, it will instantly light it up! Plus, you will get maximum free space in the room, which can further be utilized for other purposes or for assembling other storage units. This will also give an illusion of a bigger room. As already mentioned, the single beds will take minimum space in the bedroom. This feature also adds another perk in the list that it maximizes the wall space of the room, also meaning that the wall looks bigger and empty! Attain a natural and casual charm by establishing a wooden single bed in the corner of the room. The size of the guest room and the kid's room is usually smaller than every other room in the abode. And, these areas have to be adorned carefully. A single bed with storage is the best way to get dual functionality in a single entity. In the kid's room, the single bed will let your kid sleep comfortably, while also providing storage space to keep all the items of clothing and other stuff. While in the guest room, it's a perfect pick for the guest room to cater to your relatives and friends a peaceful sleep and a decent place to stow their luggage. 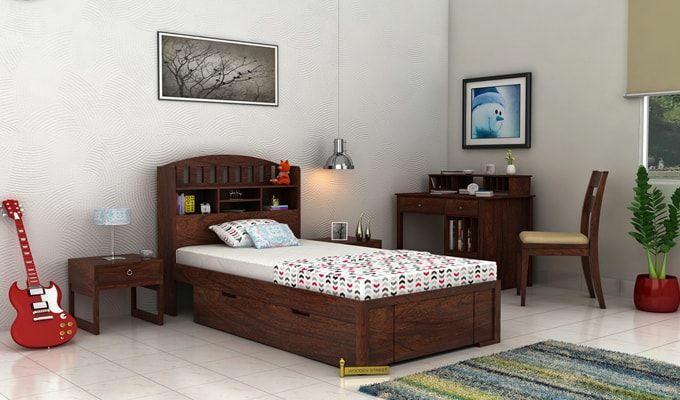 The online furniture market provides ample designs, styles, and types of wooden single bed. From upholstered to the trundles, the range will make you go ‘Wow’.  The upholstered single beds have a high headboard and are fabric upholstered. The tight tufting in diamond designs or other, make these single bed a royal treat.  The trundle single beds are the next on the list of best ones! You can savor the comfort of two beds in a single bed. The second bed is beneath the top one and can be pulled out whenever you have a company.  Single bed with storage, are the last ones! Whether it has a headboard storage, hydraulic storage or side drawer storage, a single bed with storage is a must, if you are not planning to buy a wardrobe for your bachelor pad. Select the single bed design that you love the most and which also solves the primary purpose! Due to the need for everything to be A-perfect in every aspect, the single beds are the ace in their genre. A single bed is neither too small to be not paid attention and neither too big to take over the entire floor space. It is perfect and also adds visual interest in the room! The amazing structure and intricate carvings glorify the compact size with quintessential charm. For a gorgeous appeal, add linens and bed skirts to the single bed. Opt for a single bed with wooden material for a dash of naturalness and elegance. Highlighted above are the perks of owning a single bed. Get the finest design of single bed and experience them all!